Rémy Martin's eau de vie is aged in French Limousin oak casks charred and formed to the exact specifications necessary for crafting Louis XIII. The liquid undergoes a dynamic aging process, where it's transferred to older barrels several times, usually from one cellar to the next, creating the most balanced climate for aging. 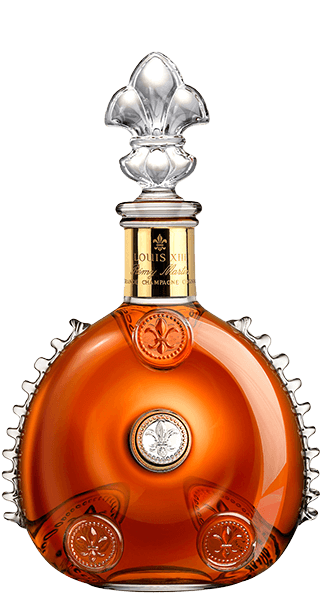 The traditional Louis XIII Cognac is a stunning study in alchemy, a flawless blend of over 1,200 different types of Grand Champagne eaux-de-vie married together. The youngest eau-de-vie? A whopping 40 years old, with the oldest clocking in at over 100 years old (a longer lifespan than 99% of the human population). This seemingly infinite aging process is stewarded by at least three generations of Rémy Martin cellar masters. Expect ethereal notes of refined, nectar-rich opulence. With over 250 distinct flavors to discover, this Cognac is one hell of a trip for your taste buds. And it's all bottled in the largest crystal decanter known to mankind, holding 1.75L of the best Cognac in the world. Words fail when describing this legendary stunner. What does Louis XIII Magnum Cognac taste like? The Flavor Spiral™ shows the most common flavors that you'll taste in Louis XIII Magnum Cognac and gives you a chance to have a taste of it before actually tasting it. A fragrant bouquet of flowers, sweet fruits, and subtle spice. Endless complexity. Ethereal notes of dried rose nectar, fruits, jasmine, leather, nutmeg, sandalwood, honey and wood bark, saffron, cigar box, and forest nuts enhanced by infinite length. Graceful oak, floral notes, fruit, refined, nectar-rich opulence.